Los Alamos is a very unique place: a tiny little town in the New Mexico mountains with a National Laboratory that employs more than ten thousand people. Many of the teenagers who attend our cafés have at least one parent who is an engineer or a scientist at the lab, but many only have a vague idea of what kind of scientific research is done behind the closed gates of the laboratory. 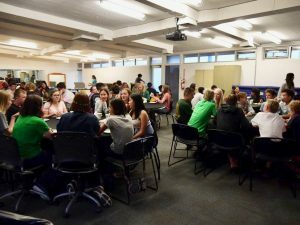 For many teens who attend our cafés it’s a surprise to know that there are people living in their community doing all kind of cool research: working on a vaccine for HIV, studying the dangers and risks of global warming, or planning missions to mars. Tell us a little about your background, how did you personally come to be involved with your Teen Café program? Since I was a little girl, I always enjoyed science very much (especially mathematics). 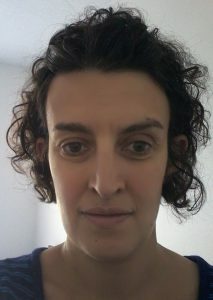 I grew up in Italy, and after high school I studied physics at the university in Milano, then moved to the United States to attend graduate school. For a few years I was part of the ATLAS collaboration, a particle physics experiment based in Switzerland that was searching for new particle discoveries in the head-on collisions of protons at extremely high energies. It was a great excitement when we announced the discovery of the Higgs Boson. 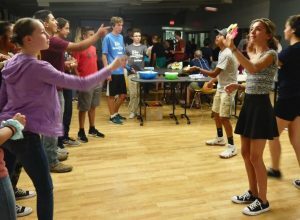 Teens demonstrate capturing neutrons to create heavy neutron stars in a café about gravitational waves. Now I am spending most of my time at home with my young children, but I am still passionate about science, and like to be involved with it in different ways. 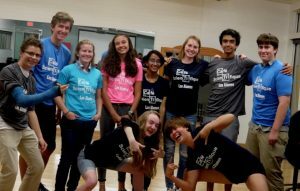 Being involved with the Teen Science Café program has allowed me to share my passion with amazing teenagers, and to learn about the cool research that scientists living in my town are doing. One stumbling block has been the teens’ attendance and communication. Most kids are involved in so many activities, and having the teen leaders attending the planning meetings isn’t always easy. I’ve seen a better response by them and better communication when I give them more responsibility. It’s when I trust their ability to accomplish a task that they show more interest in the program, and try their best to show up at the meetings. Heavy objects curving the space of time. Teens demonstrate creation of black holes. All of it! I enjoy meeting scientists that live in my community and hear about the cool research they are doing. I love sharing my love for science with younger students. But I think the best part of the program are the teen leaders! They have great ideas for the cafés and put a lot of effort in making sure our events are successful. Trust your teen leaders: give them responsibilities and they will surprise you. Don’t plan everything and have them accomplish the tasks, but rather support them so that their vision of the program can become a reality. This is a hard question… Last year we had a café on Nuclear Weapons. It was particularly interesting since we live in Los Alamos, the town where the first atomic bombs were created. I think that café left a lot of open questions in the teens that attended, helping them to understand the dilemma posed by nuclear weapons.